In Hong Kong, you stand in round-the-block queues, outside old-fashioned bakeries that have been around for years, to eat traditional Cantonese tarts, buns and cakes. You can find everything from delicate mooncakes and milk buns to char siu baos, or BBQ pork-filled buns, steaming up bakery windows. The boom in Western bakeries, thankfully, has done nothing to diminish the popularity of local delicacies. In fact, traditional and classic flavors are very much in demand. Hongkongers are among the world’s most discerning and food-obsessed people, who place a high importance on what they eat. Because of this, there’s a continued quest for gastronomic excellence and authenticity. It motivates local bakeries to push boundaries and remain true to the “made in Hong Kong” trademark, keeping their ovens and workers on the island, instead of crossing the border into China, where costs are undeniably lower. It is believed that its origins are in the British custard tarts. Understandably so, as Hong Kong was under British rule from 1841 to 1997. Hong Kong, to this day, remains very much an internationally minded port city, especially when it comes to its dining culture and habits. The Hong Kong egg tart displays a decadent yellow hue, which is intense in flavor. The custard filling – eggier and more silky-smooth than the British tart – sits prettily inside a crispy, short cookie crust. It’s a hugely popular snack to be enjoyed any time of day. The egg tart is also popularly eaten as a dim sum delicacy. These days, you can find more creative variations, such as chocolate tarts, green tea tarts and bird’s nest tarts, being produced in modern bakery kitchens. Tai Cheong Bakery is one of Hong Kong’s loved bakeries. Established in 1954, the bakery gained fame as the favorite of Hong Kong’s last British governor. Locals and tourists line up for Tai Cheong’s tarts, which can be savored fresh from the oven throughout the day. The bakery has since expanded to include multiple locations across Hong Kong. Its original location in the main Central area remains the most popular. Wife cakes have a light, flaky skin, made from pork lard, and are glazed with an egg wash for a golden-brown finish. Their translucent, chewy filling is of sweet winter melon, almond and sesame paste. These cakes are believed to have originated within the GuangdongProvince in China. The story has it that when the cakes were highly praised, the husband of the woman who baked them proudly declared that they were his “wife’s cakes” and the name simply stuck. Wing Wah is an award-winning bakery. Like most others, Wing Wah started small in a corner shop in Yuen Long in 1950. Today, Wing Wah Bakery has expanded to include cake shops in Hong Kong, China, Australia, the US, UK, Canada and New Zealand. Their wife cakes are freshly baked daily; each one is still lovingly handmade. Baker Leung explains, “One day for the semi-finished pastry and filling, another for the baking, with every step and detail given equal importance.” Wife cakes are also sold in convenient, individual packs – perfect souvenirs for visitors to take home. The pineapple bun, or boh loh baau, is ubiquitous in Hong Kong. In reality, this palm-sized bun contains no trace of the fruit its name suggests. It’s the checkered, crunchy and sugary top, resembling the skin of a pineapple, which has earned this Hong Kong pastry its name. And it is this golden-brown crusty topping that’s quite special. The bun itself is pretty basic. Its top half is made of a cookie-type dough; the bottom half is made from Chinese-style bread dough that’s softer and sweeter than Western bread. Firm on the outside and pillowy soft on the inside, the pineapple bun is utterly delicious when cut in half and served with a dollop of butter on its bottom layer. This small, family-run bakery, set up in 1943, has stood the test of time – a rare feat in an industry plagued by rising competition and costs. They have been producing pineapple buns for over 70 years now. For Tai Tung Bakery, quality is crucial. While about 85% of the bun is now made by machine, the crust is still handmade. It takes the bakery 24 hours to make a pineapple bun – from mixing flour to baking – producing about 1,000 buns a day. Kee Wah Bakery: This bakery opened as a neighborhood grocery store back in 1938. It now has a network of over 63 shops in Hong Kong alone, with another 40 in Macau, China, Taiwan and the US. 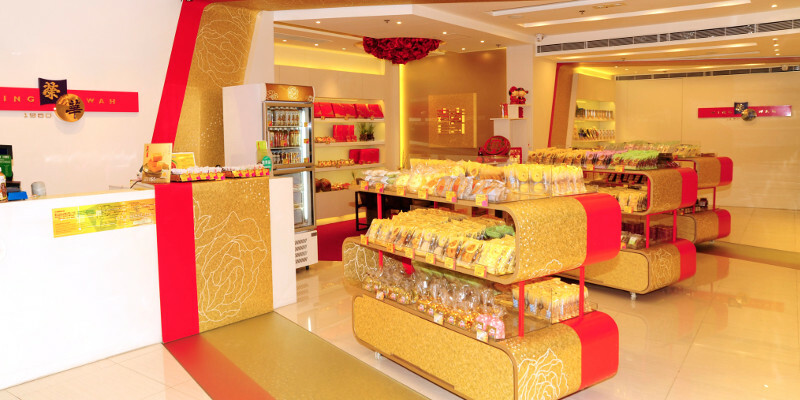 Kee Wah bakeries stock over 500 varieties of snacks from egg rolls and pineapple shortcakes to mooncakes. You can read more in our print magazine Asia Pacific Baker & Biscuit, Spring 2017!